The most obvious abnormality is that the right subclavian central venous catheter tip has curled upwards into the right internal jugular vein instead of downwards into the superior vena cava. The other finding is that of soft tissue swelling in the right neck and superior mediastinal widening. This patient had severe coagulop-athy and repeated attempts at the central venous catheter insertion resulted in a neck hematoma which had also tracked inferiorly causing a mediastinal hematoma. As a result, the patient required intubation to secure the airway. Case 27. 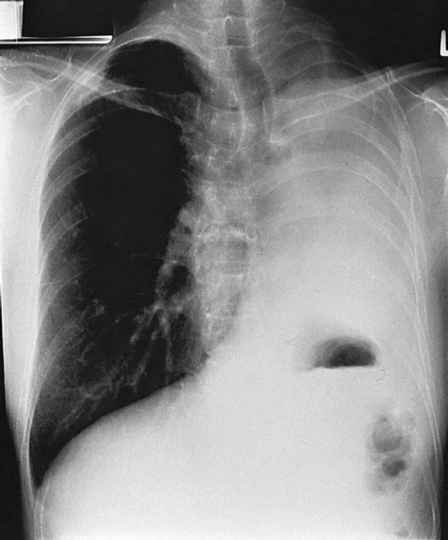 This patient was asymptomatic. Past history was significant for previous thoracotomy. 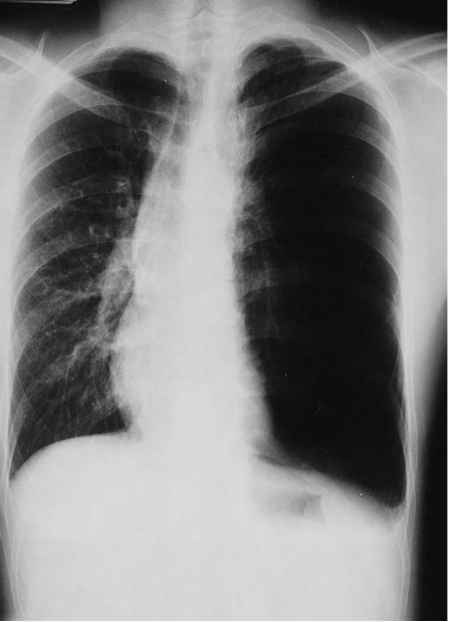 The CXR is shown (Fig. 27.1).